This entry was posted on July 6, 2011 at 11:44 pm and is filed under Art, Swimming pools, Tokyo lifestyle. You can follow any responses to this entry through the RSS 2.0 feed. You can leave a response, or trackback from your own site. Tattoo banning as a selling point..I think you might be right! I also agree that there are some great tats on some of the “gangsters” guys I’ve come across. Nice post! 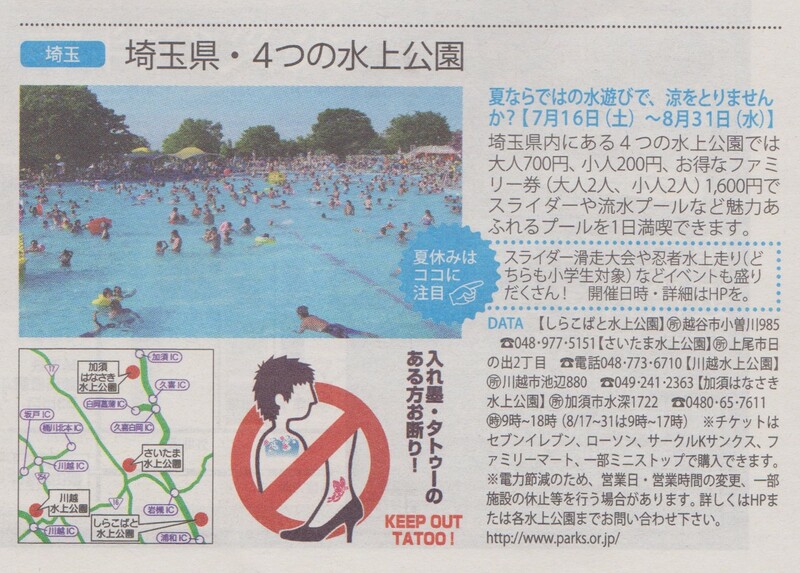 I’ve heard the version also, that tattoos are percieved to be unhygienic – hence the ban, and general dislike in all pool/onsen type of places. At this point its totally a class issue. Tattoos in Japan have always been a symbol of being some kind of “outsider” – all the way back to the Edo era merchants who used them as a way to display their prosperity while getting around the caste-based dress code. They have always been ways of the “lower” classes or outsiders thumbing their noses at polite / mainstream society. Traditionally the west isn’t really so different, even though popularity and acceptance of tattoos has skyrocketed in the last 20 or so years. The solution? Either don’t get tattoos or don’t move to the burbs. Seems like untattooed people are in the minority in places like Koenji lately. By law public pools cannot bar you from entering or even make you cover up.